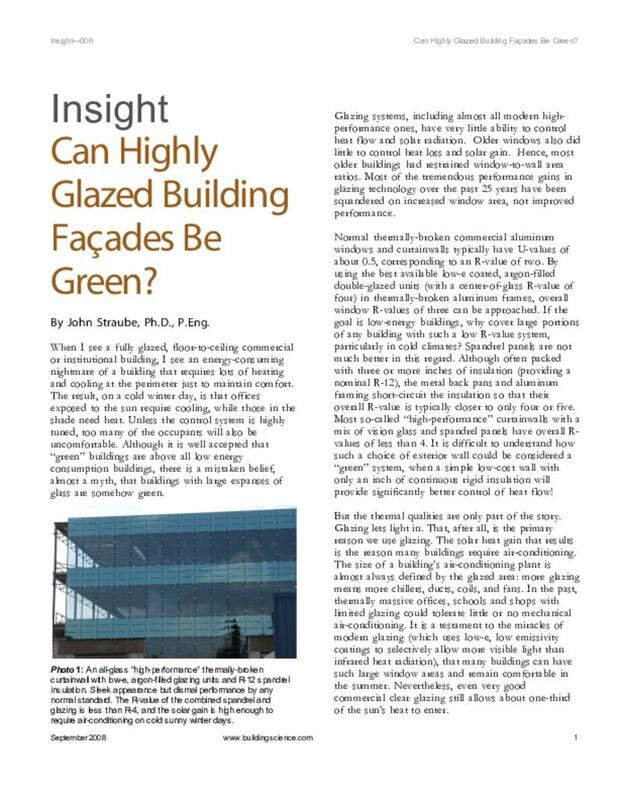 » BSD-006: Can Highly Glazed Building Façades Be Green? When I see a fully glazed, floor-to-ceiling commercial or institutional building, I see an energy-consuming nightmare of a building that requires lots of heating and cooling at the perimeter just to maintain comfort. The result, on a cold winter day, is that offices exposed to the sun require cooling, while those in the shade need heat. Unless the control system is highly tuned, too many of the occupants will also be uncomfortable. Although it is well accepted that “green” buildings are above all low energy consumption buildings, there is a mistaken belief, almost a myth, that buildings with large expanses of glass are somehow green. Glazing systems, including almost all modern high-performance ones, have very little ability to control heat flow and solar radiation. Older windows also did little to control heat loss and solar gain. Hence, most older buildings had restrained window-to-wall area ratios. Most of the tremendous performance gains in glazing technology over the past 25 years have been squandered on increased window area, not improved performance. Photograph 1: An all-glass “high-performance” thermally-broken curtainwall with low-e, argon-filled glazing units and R-12 spandrel insulation. Sleek appearance but dismal performance by any normal standard. The R-value of the combined spandrel and glazing is less than R-4, and the solar gain is high enough to require air-conditioning on cold sunny winter days. Normal thermally-broken commercial aluminum windows and curtainwalls typically have U-values of about 0.5, corresponding to an R-value of two. By using the best available low-e coated, argon-filled double-glazed units (with a center-of-glass R-value of four) in thermally-broken aluminum frames, overall window R-values of three can be approached. If the goal is low-energy buildings, why cover large portions of any building with such a low R-value system, particularly in cold climates? Spandrel panels are not much better in this regard. Although often packed with three or more inches of insulation (providing a nominal R-12), the metal back pans and aluminum framing short-circuit the insulation so that their overall R-value is typically closer to only four or five. Most so-called “high-performance” curtainwalls with a mix of vision glass and spandrel panels have overall R-values of less than 4. It is difficult to understand how such a choice of exterior wall could be considered a “green” system, when a simple low-cost wall with only an inch of continuous rigid insulation will provide significantly better control of heat flow! But the thermal qualities are only part of the story. Glazing lets light in. That, after all, is the primary reason we use glazing. The solar heat gain that results is the reason many buildings require air-conditioning. The size of a building’s air-conditioning plant is almost always defined by the glazed area: more glazing means more chillers, ducts, coils, and fans. In the past, thermally massive offices, schools and shops with limited glazing could tolerate little or no mechanical air-conditioning. It is a testament to the miracles of modern glazing (which uses low-e, low emissivity coatings to selectively allow more visible light than infrared heat radiation), that many buildings can have such large window areas and remain comfortable in the summer. Nevertheless, even very good commercial clear glazing still allows about one-third of the sun’s heat to enter. It is true that daylight can offset the need for electric lighting and provide a psychologically healthy connection to the outdoors, but one doesn’t need floor-to-ceiling glass for that. In most occupancies and building types, there is no benefit to vision glass installed at floor levels (unless the occupants spend much of their time lying on the floor near the window), but there is a substantial energy penalty. Good daylighting design can reap all the benefits of glazing using vision glass covering less than half the enclosure. Numerous studies have shown there are no daylighting or energy benefits with window-to-wall ratios over 60 percent, and in most cases an area of between 25 and 40 percent is optimum (that is, lowest energy consumption). Even at these ratios, windows in a low-energy building should generally be high performance (triple-glazed in cold climates), with large thermal breaks (over 1/2" thick) and some form of exterior shading (preferably operable). Photograph 2: Almost the entire façade of this condominium tower is covered with low R-value and high solar gain curtainwall. It is almost impossible to achieve a low energy, comfortable building with this approach. How should one choose glazing for green, low energy commercial buildings? At the most basic level, there are three critical measures of performance that must be chosen in design, and specified in contract documents: The U-value (1/R-value), the Solar Heat Gain Coefficient (SHGC) and the Visible Transmittance (VT). The U-value is the reciprocal of the R-value. A U-value of 0.33 is an R-value of 3 for example, (except that in the case of glazing systems the U-value includes the effect of surface films, unlike walls). As the climate becomes cold or very hot, a low U-value becomes important for energy savings and for comfort. Buildings with low U-value windows and/or curtainwalls can dispense with special, and costly, perimeter heating even in very cold climates. The Solar Heat Gain Coefficient (SHGC) is the fraction of solar radiation that hits the glazing that passes through the glazing and becomes heat inside the room. For example, if the SHGC of a glazing unit is 0.50, and the sun is shining on the window with an intensity of 250 Btu/hr/ft2, 125 Btu/hr/ft2 will enter the building as heat. The lower the SHGC the greater its shading ability. Although specially-designed houses in cold climates often can benefit from solar heat gain in cold weather (ie, passive solar heating), modern offices and assembly spaces should have sufficient insulation and airtightness that the interior heat generated by occupants and activities provide most of the heat, even in cold weather. Bright sunny days often cause overheating of over-glazed south-facing spaces during cold (e.g. -10 deg F) days, whereas during unoccupied nights, when heating is needed, the low R-values result in heating demand. Operable exterior shading both obviates the need to choose a low SHGC window and provides much more control, but entails significant design effort, changes the appearance, and can be costly. Increasing opaque spandrel area, thereby reducing vision area, also reduces the total solar gain into the building of course. Photograph 3: Residential windows usually come with an affixed sticker providing verified and useful performance values: the U-value, Solar Heat Gain Coefficient and the Visible Transmittance. Commercial window specifiers need to define these performance metrics in their construction documents. The third measure, visible transmittance (VT), reports the percentage of visible light transmitted through the glazing. A typical clear, double-glazed window will have a VT of 0.60, meaning it admits 60% of the visible light. When daylight in a space is desirable, as in showrooms, high VT glazing is a logical choice. In offices and classrooms, where glare is a real issue, mid-range VT may be specified for large glazing areas, or high VT for small glazing areas. Low VT glazings such as bronze, gray, or reflective-film windows were often used in office buildings of the past as they also reduced solar heat gain. Modern spectrally selective (SS) windows allow for both a high VT with a low SHGC (and always have a lower U-value than uncoated glass). These SS windows reduce allow for significant daylighting and psychological benefits while avoiding overheating during sunny days. In the end, glazing is a classic design problem that requires one to balance the desire for thermal comfort, energy efficiency, and light quality (all of which require small window areas) with equally important desires for view, daylight, and connectivity with the outdoors (all of which benefit from large vision-glass areas). Less window / curtainwall area, and higher system performance is the low-cost, high performance prescription for buildings suffering from excessive glazing area. Carefully choosing, and then specifying, overall system U-value, SHGC, and VT is the best start to delivering high performance glazing on your next project. Many designers have shown that beautiful and high-performance buildings can result from a proper balance of glazing quantity and quality. All too often, however, designers appear to choose all-glass curtain walls or floor-to-ceiling strip windows because they make it easy to create a sleek impression while leaving all the tricky details in the hands of the manufacturers. How much longer can we afford to pay the energy bills that result from that choice? It’s high time to revive the craft of designing beautiful facades that don’t cost the earth. Post Script: The very best in commercial aluminum curtainwall and windows are capable of R-6 to R-9. There are super windows in research labs with R-values of 10, and even 12 with dynamically operable shading capable of reducing the solar gain to less than 0.10 during bright sun and opening up to 0.60 or more during dull days. Other systems that incorporate light diffusing elements (such as Kalwall and Solera) and phase change materials (such as Glass-X) can reduce energy flows across daylight panels by a factor of ten! Eventually such technology should become more affordable and available, opening up the possibility of high glazing area and high performance. Uoverall= (WWR * Uwindow + (1 - WWR)* Uwall), where U = 1/R. The results of a number of scenarios are plotted in the chart below. Typical curtainwall systems have an R-value of only 2 or 3, with "high performance" systems (not shown) using highly insulated (say R-12) spandrel panels and best-in-class double glazing (with low-e and Argon) may achieve R-4. Only a few systems, such as the Kawneer 7550 series or Visionwall, can achieve R-values of 6 or more. Curve 1 above is for standard U=0.50 thermally-broken aluminum punched windows with air-filled double-glazed insulated glazing units in a R-12 batt-filled steel-stud brick veneer wall system (a true R-value of R-6 when thermal bridging is considered). The overall effective R-value of this wall is around 3 to 4 over the normal range of commercial window-to-wall (WWR) ratios of 25 to 50%. Curve 2 shows that Increasing the R-value of the opaque wall to R-11 by adding an inch of foam on the exterior results in an increase of only R-0.5 to R-1.5 for the overall R-value for the same range of WWR. Curve 3 shows how significant an impact window performance can make even if a good wall is provided. An externally-insulated R-16 wall, when mated with poor windows produces a vertical enclosure with an R-value of only R-3 to R-6 for the normal range of window areas. Curve 4 assumes a good-quality window frame with top quality glazing (low-e, argon-filled): the result for the overall vertical enclosure is still only R-4 to R-7. These first four curves cover the performance of a wide range of commercial enclosures with a wide range of cladding types. Despite what most designers and owners think, the simple conclusion is that modern commercial vertical enclosures actually have an R-value that is rarely over 7, and more likely in the range of 3 to 5! Curves 5 and 6 provide an idea of the significant improvements that are possible. Using best-in-class thermally broken aluminum frames and high-performance glazing (U=0.30), Curve 5 shows that even with an R-40 wall, the overall R-value will be in the 7 to 12 range for WWRs of less than 40% (the highest ratio recommended for high-performance buildings). Even though this is a low-level, it is still about significantly more than the alternatives. The grey curve below Curve 5 shows that decreasing the opaque wall R-value from 40 to 20 has little negative impact particularly at high glazing ratios. Curve 6 employs commercially-available low-e, argon-filled triple-glazed units in an insulated fiberglass frame, to deliver a U-value of only 0.14. Even with a wall insulated to "just" R-20, such a combination can deliver an overall R-value of 12-14, two to three times more than typical commercial vertical enclosures. In all cases, it can be seen that high glazing ratios generate enclosure walls that are expensive to purchase with very high heat loss and heat gain. This high ratio should be avoided in both individual spaces, such as meeting rooms, as for the whole building on average.